File containing the attractiveness, desiccation resistance and cuticular hydrocarbon (CHC) data. File containing the pedigree data. File describing the data and pedigree. 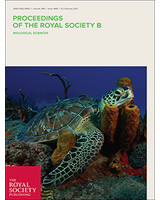 Citation is not yet available for this publication from Proceedings of the Royal Society B. It will become available shortly after the publication appears. While the reproductive benefits of sexual displays have been widely studied, we have relatively limited evidence of the fitness costs associated with most display traits. Insect cuticular hydrocarbon (CHC) profiles are sexually selected traits that also protect against desiccation. These two functions are thought to oppose each other, with investment in particular compounds believed to increase attractiveness at the expense of compounds that protect against water-loss. We investigated this potential trade-off in a quantitative genetic framework using the Australian field cricket, Teleogryllus oceanicus. Several compounds were significantly genetically correlated with either attractiveness or desiccation resistance. Of these compounds, one was negatively genetically correlated with attractiveness but positively genetically correlated with desiccation resistance. Furthermore, scoring each individual’s overall CHC profile for its level of attractiveness and desiccation resistance indicated a negative genetic correlation between these multivariate phenotypes. Together, our results provide evidence for a genetic trade-off between sexually and naturally selected functions of the CHC profile. We suggest that the production of an attractive CHC profile may be costly for males, but highlight the need for further work to support this finding experimentally. Genetic covariation between the CHC profile and attractiveness suggests that females can gain attractive sons through female choice.